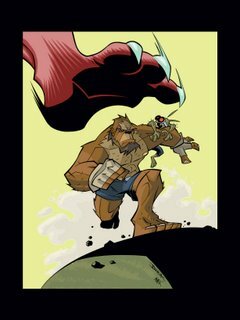 for those of you who don't know, craig has a blog of his own over at www.craigrousseau.com, and has posted the sweet kevin nowlan perhapanauts piece--colored masterfully by craig himself--over there! so head on over and check it out! and bookmark it while you're at it; craig's is a blog you should be checking out regularly anyway. he posts some pretty pictures over there and usually keeps everyone up-to-date with what he's doin'! i'm gonna keep you in suspense and instead post this beautiful--and fun!--derek fridolfs pin-up! a member of the tellos family from way back, derek has been so kind and patient and always ready to lend his beautiful inks to a bunch of the different tellos stories we did along the way. i say patient because derek--along with a handful of other friends (maybe they're not friends anymore...)--are on a list of people that mike and i owe money to that was promised us years ago by image. derek is one of those guys who LOVES comics, loves drawing, and loves to share his talents and experiences with kids and the community, doing programs and workshops on comics and drawing. and so when we got the perhapanauts up and running, derek, out of nowhere, sent us this awesome pin-up! we loved it and wanted to include it in the trade, but had already promised those pages out to the other guys. so, as craig said, derek's will be the first in our second collection. so we got that goin' for us. it was colored by mark, but i don't know his last name.